Navy Yard is a very dense place to me. To me, it’s not a foreign place on the news, with words like “unknown gunman” “civilians shot” “possible terrorism” attached to it. It’s generally not a multi-page story on the New York Times. 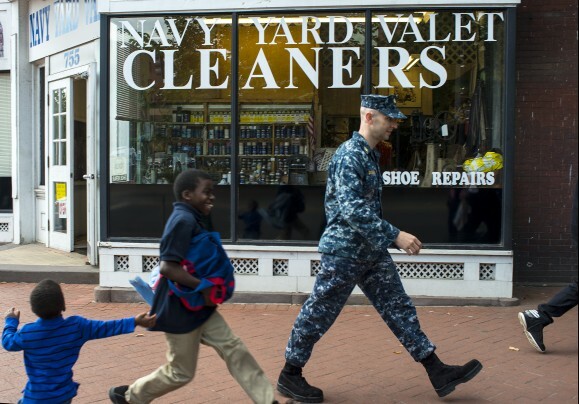 It’s not only a relatively open naval base — it’s a part of a neighborhood, “near southeast”. It’s a part of my home. I heard about the event about a half-hour after the shots began on Monday. I texted my partner. I emailed my old work associates. I sent Facebook messages. I didn’t pray. I didn’t watch the news. “It ought to obsess us, it ought to lead to some sort of transformation,” is how President Obama puts it. It ought to. It certainly ought to. I used to work at Navy Yard. My partner works there every other day at the DC SEU. Three of my friends work at the Trapeze School of New York in Navy Yard, and a friend moved to the Waterfront area to be closer to the rig. Two of my close friends live on M Street. My current studio is a quick mile away in Capitol Hill. I’ve been to events at the fairgrounds there, events where everyone is sloshed, and the music is way too loud. 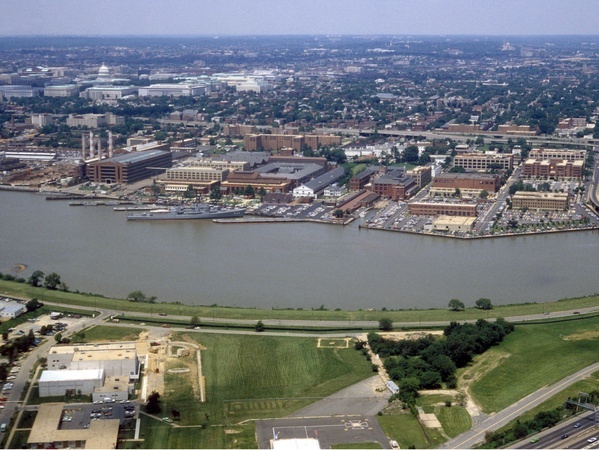 Several of my clients live there, in “near southeast,” right on the Anacostia River. 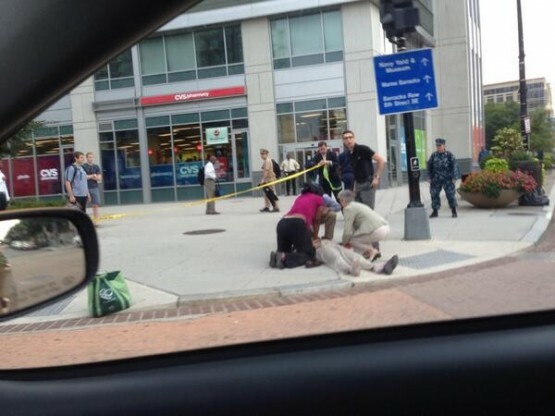 I remember running late to an interview at Navy Yard. I rushed across M Street, running in my fancy interview shoes, past the vendors at the Tuesday farmer’s market by the Department of Transportation. I stumbled on the gravel in the unfinished blocks past the DOT, pebbled lodged into my palms. When I returned from the interview, job un-offered, I remember stopping back towards the pebbles, and just kicking the gravel. I sat on the curb, and I sniffled. I was alone on the street, on one of those isolated spots in the area, where the sidewalks are wide, but there’s no one walking. And I sobbed. I don’t like to cry around people — my face gets blotchy and I lose rhetorical grace. 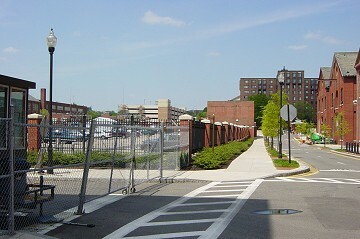 And I blessed how deserted Navy Yard was, at 11:14am on a Tuesday, how still and sunny, so I could pity myself in privacy. It’s a quiet place, with quiet corners. I remember “staffing” a fundraiser there with my housefamily. There was a band, and we all showed up in force, the merry Keep family, all of us getting sloppy and exuberant on a bright October night. We were gifted two cases of wine, and a few bottles of rum (which we tore into on the metro). When we got home, we collapsed on the floor, all of us, spooned on the hardwood floor. One of my friends from that night recently committed suicide. The clearest memory I have of him is from the pavilion, laughing and dancing with him. He’s still alive to me. Navy Yard is a real place to me. On the news, they discussed the proximity of the shooter to places of power, to the White House, Congress, and the Hill. 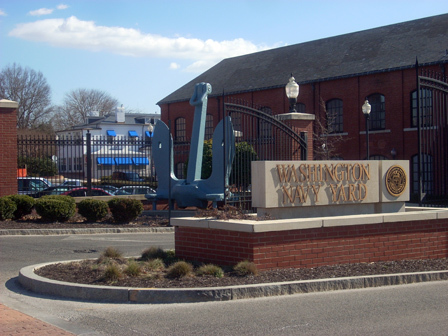 To me, Navy Yard is on the street that my friend lives on. It’s where we go to watch the Nats win (and lose). There are two elementary schools a stone’s throw from the Naval Base. It’s just a place in my city. 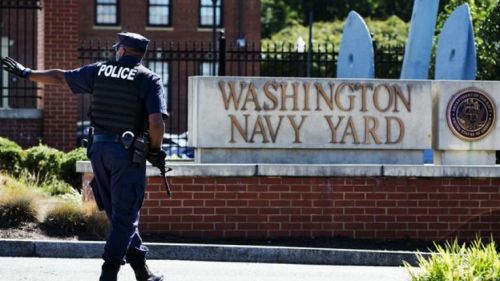 Last Tuesday, I thought of everyone I know who goes to Navy Yard on a regular basis. I thought of the river, the barracks, the park where they play jazz. I thought of names, and I waited. It was hard to breathe. 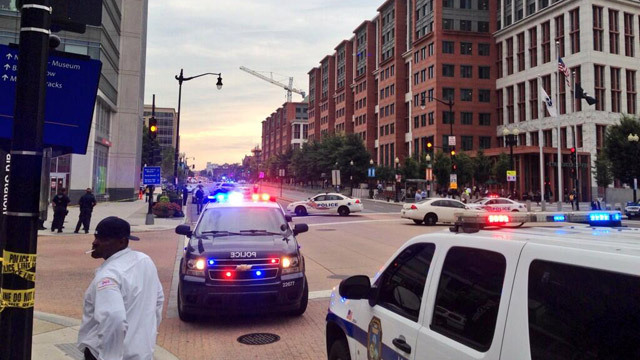 I peaked at the news, and saw the buildings (that I know so well) as a backdrop to squad cars and flashing lights. The standard scene that we all know so well: the deranged shooter, the brave police, the stricken families, the unknown death toll. I check twitter. I read DCist. I checked the Post. I texted more people. I read about Aaron Alexis, his medical history, his ineffective background check, his origin and his end. My friends could have died. My partner could have died. My very close friends. And my neighbors, the people I see every day. The utility workers and office workers, and contractors. The everyday working Washingtonian. This fear is part of how we live. And it ought to obsess us. And it has obsessed me in the past. I’ve always wondered how it felt, in Aurora and Newtown, in Boston, in Middleton, at Sandy Hook Elementary School, Virginia Tech, and Ft. Hood. It can seem surreal from afar — the way the news conveys the action (and often inaction) of these killings. It can feel easy to detach from them, to just imagine that the shooter is within a secured Naval Base, sure to be restrained within moments. Like all the video games I grew up playing, and all the movies I watch. On the screen, the people onsite seem like NPCs, saying the same things with each new reporter. It all bleeds together. Years ago, I wondered how it would feel in my home. When it was my city, my neighbors, all calling families and friends, checking in: “Are you okay? Is everyone in your office okay? Did your kids go to school today?” I wondered how long it would take to heal, or if the killings would stain the ground. I wondered when the streets would feel safe again. The camera crews and EMTs have left and the news moves on. The Washington Post and Think Progress ran an excellent story on the quick “forgetting” of the incident, discussing the quick return to business-as-usual. Aaron Alexis is dead. While President Obama pushes for reform in gun control legislation, the issue is muted and dialed down. Our tears are evidently not enough. I hear that phrase every day. And I hate it. There are no rising heroes and no novel atrocities here. Just an everyday random killing. Nothing connected to national security, or the overhanging everyday fiscal crisis, the daily suffering in Syria, the typhoon that killed at least 25 people in Southern China. Days after Navy Yard, shooter(s) killed three people and injured twenty-three people in Chicago– *that* story barely dents national news. This is part of how we live, right? This is our new normal. We grind on. We check our phones. We go to football games. Particle physics progresses. I help throw a bachelorette party. I go to work. I fall asleep in my clothes. We have conversations about it. Conversations that circle endlessly, ineffectually, and (sometimes) obsessively. We talk about: the race of the shooter. Militarism. Mental illness. Gun laws in Virginia, and how much worse it could have been. Aaron Alexis. Our government’s disinclination to adjust gun safety laws. The transition from Congress to K Street. The mothers and families of these killer. Aaron Alexis’s mother. NRA. The “black NRA” viral video. The norm of killings and gun violence. The shootings in my neighborhood, the senseless incarseration and demonization of African American youth, and the way lynching looks in our modern day. Who is Aaron Alexis. Erasure. Mental illness and access to guns. What are guns are for. How easy it is to fire a gun. (It is so much easier than I expected.) Poverty. History. Density. Suicide. Numbness. Who would you shoot. The victims and their families and grief. Mayor Gray, in a moment of leadership. Aaron Alexis. The Invisible Man. Syria. Massacred children. Is a killer a victim. 100,000 dead. 1,400 gassed. 12 killed. 14 wounded. I try to be better to strangers. For me, the most awful thing about these events is the complicity we bear in normalizing them, and normalizing the monumental violence in our world. I try to be a better listener, a better celebrater-of-others, a better employee. I try to be more honest. I’ve fucked up a few times, but I’ve tried to make it better as quickly as I can. I don’t want this to be a part of my life. If there is senseless violence, I would like there to be more senseless kindness. If there are so many unsafe spaces, I would like to build more safe ones. There are thirteen people who lost their lives last week. Gerald L. Read. Richard Michael Ridgell. Michael Arnold. Martin Bodrog. Arthur Daniels. Sylvia Frasier. Kenneth Bernard Proctor. Kathleen Gaarde. John Roger Johnson. Mary Francis Knight. Frank Kohler. Vishnu Pandit. They could have been my friends, and I wish I had known them. And I wish I had known Aaron Alexis. Not so much normalizing but enabling. People like you with attitudes like yours enable killers and the places where they kill. The NRA is still right. You need to sometimes put people in mental hospitals when they are dangerous and treat them, and you need to have defense in depth with firearms in the hands of responsible people. Same thing is about schools and cries of outrage over the idea that maybe we need guns in the hands of responsible people in schools to protect kids and teachers. I am coming to believe that some people hate guns more than they love kids. If you want to see the face of the enabler of violence go look in the mirror. Good people with good intentions and no clue about what the real problems are or how to solve them. Right, I can’t think of anything that could possibly go wrong with an armed gunman shooting at a bunch of civilians, and then every “responsible” person happening to have a gun and starting to shoot also. That sounds like something that would work out well in real life and not just in the movies, and not lead to way, way more people dying. It is actually people like you, who want MORE people to have guns in the face of overwhelming evidence that more guns actually leads to more guns being used to kill people, who are responsible for letting events like this happen. In no other industrialized country do the people simply accept mass killings as way of life, and gun murders as something so normal and ordinary that they don’t warrant any kind of news coverage unless it’s a cute white person who got shot. What you are doing is not thinking. It is feeling. Some years ago three Palestinian terrorists walked into a restaurant in Tel Aviv with the idea of killing a bunch of Jews. They had guns of course. What they apparently didn’t know was that some of their victims also had guns, concealed handguns. They did manage to kill a couple with their first shots. Then they were shot down in a hail of return fire that killed two and wounded and incapacitated the third one. If people are not defenseless they can defend themselves. In a situation like the one above they are more than likely going to be killed if they don’t. Only in the feelings of people who know nothing about it. You said “studies” but you really meant “study,” the one you gave a link to which came out the other day and has not been seriously vetted yet. A Dr. Kellerman came up with a study like that years ago until his conclusions were shown to be total bunk and actually an entirely different conclusion comes from his data. Dr. Gary Kleck did a very respectable study showing that Americans may defend themselves up to 2.5 million times a year with firearms. You feel there is overwhelming evidence. But there isn’t. In fact there is strong evidence it doesn’t really make a difference at all. Except I know for an absolute fact that doesn’t apply to where I live in Texas. In the town where I live we probably have more guns per household than the gangs on the south side of Chicago. We have tons of guns. I need to go buy a bigger gun safe right now. But most years we have 0 per 100k firearms homicides in my town. The fact is that a huge portion of the gun homicides in the U.S occur in very specific places – inner cities where gangs are killing each other and fighting over drugs. That’s where it is at. The really important thing to understand about this statistic is that most police killed with their own gun are uniformed police who carry their guns openly. Not absolutely always the case, but very, very frequently. So the bad guys know they are armed. They can see the guns right their out in the open. Sometimes in physical confrontations with bad guys the cop loses his gun and gets killed. Here is the important difference. When I carry a concealed handgun, and I do legally every day, no one knows I have it. People carrying concealed handguns don’t very often have their gun taken away because by the time the bad guy doesn’t know beforehand they have a gun. It tends to be a big surprise to them. That is why responsible gun owners who carry almost always carry concealed even when open carry of a handgun is legal. And you may have noticed that we – that is concealed carry supporters – have won big time in the U.S. in the last 20 years or so. Almost all states now have some form of concealed carry. Also, 10 is not a very big number. More police are killed every year with their own gun than that, but it is suicide. Here is the fallacy of that statement. Two thirds of all “gun deaths” in the United States are suicides. People who commit suicide with a gun are not “making a plea for help” but really mean to kill themself. If they don’t have a gun then they will find another way. So if you could magically remove most guns from society you would still have most of those suicide deaths, just by other means. Then you could say you had reduced “gun deaths” but in fact you have not really reduced these deaths – just changed the method. Russia as 1/10 as many guns as the U.S. per person, yet manages a homicide rate twice that of the U.S. That shows that if people want to kill other people they can, and will do so without guns (which is why Russia is most frequently left out of gun banner statistics). I don’t think you are being entirely honest here. 1. When you are in great danger from muggers, rapists, burglars, murderers, and psychopaths, WHEN SECONDS COUNT, THE POLICE ARE ONLY MINUTES AWAY. That is why police are trained to draw yellow chalk lines around the bodies of victims and collect evidence. It may also account for why so many police commit suicide, having seen the reality of helpless victims slaughtered by violent sociopaths. If you ask rank and file police a very large percentage are frustrated by their inability to save these victims, and many of them fully support allowing potential victims to be armed in self defense. 2. The police have no legal obligation to protect you (or your family) and cannot be held legally liable if they fail to, even if they are negligent in that failure. Check it out. This has went to the Supreme Court more than once. Given that the police most likely cannot be there to protect you, and the fact that they will not be held liable if they do not protect you, by what moral standard do you claim a right to make victims unable to protect themself. By what moral right do you justify disarming the innocent in the face of brutal criminals and sociopaths? Like I said at the beginning of this conversation, you are full of moral certainty but your lack of knowledge enables violence and violent people over the innocent.